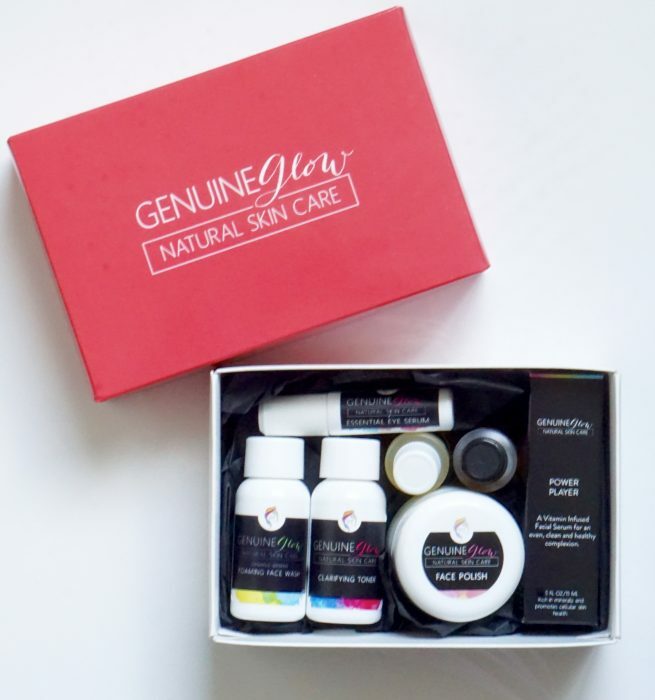 New to Genuine Glow? Our Best Sellers are available for you to try in a convenient sample size set. Organic Greens Foaming Face Wash – A healthy, daily face wash loaded with antioxidants, nutrients and vitamins from leafy green vegetables. Clarifying Toner – Clear, calm, freshen, tone and revitalize the look and feel of your face with this clarifying toning astringent. Face Polish – An Exfoliating Cleanser made from Vitamin C and natural citrus that leaves your complexion smooth, soft, even and bright. Day Glow – A liquid facial moisturizer designed to provide your skin with the necessary nutrients it needs for a glowing, healthy complexion. Flawless Beauty Sleep Nighttime Serum – The Ultimate Nighttime Transformation Beauty Oil. Essential Eye Serum – Formulated to treat, hydrate, repair, firm and protect the delicate eye area. Power Player – Vitamin Infused Facial Serum for an even, clean and healthy complexion. Essential Eye Serum – Containing Pomegranate, the most powerful antioxidant of all fruits, this blend is anti-inflammatory, mineral-rich, healing, calming, and firming. With its high Vitamin C content, our Essential Eye Serum helps with cell growth and regeneration, speeds healing, and reduces the formation and appearance of lines and wrinkles. Power Player – Vitamin Infused Facial Serum for an even, clean, and healthy complexion.